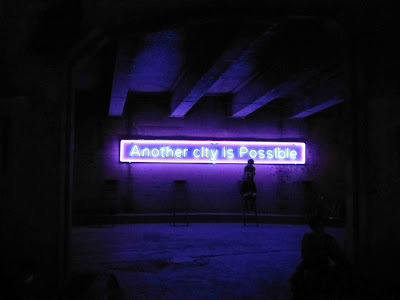 I agree with a neon sign under the Spring St. bridge awhile back. Especially after hearing about a bike riders and a local gang clash on outskirts of Montecito Heights over the weekend. Seems bottles were thrown at the passing riders which turned to yelling and more throwing of objects and then a girl gets pushed off her bike and then shovels start swinging and just all out ugly mayhem. One guy was shot but he has survived so far. No matter who was wrong, both sides could have squashed this beef before it escalated to that. Man it didn't even need to start. Too much stupid macho tough guy skinkeye posturing. So sad. Our lovely neighborhood! Brand Nubian "Punks Jump Up"
Link to a newspaper with the story or anything? Well I happened to walk past about 20 frantic riders at the bottom of our hill Friday night. My out of town buddies joked "are they a gang?". I laughed and said no they are just a bunch of people that go on midnight rides. Then I read on Laist what happened, here is that link. Haven't seen much more info unfortunately.